Tonight’s patch will introduce our first major event of the new year and an AC scratch. Everyone must work together in unlocking the panels to receive the rewards. Other campaigns and boost events will be added during and after maintenance. January 26th @ 19:00 JST or 5:00AM EST. Clear some client orders from Xie to receive several items. 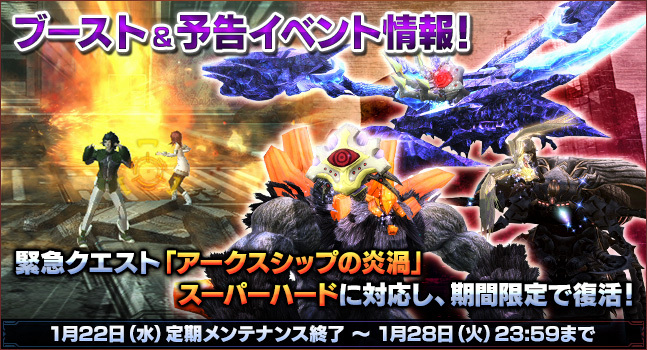 Players who sign up with a new account for Phantasy Star Online 2 will receive several prizes. Take this opportunity to invite a friend to enjoy Phantasy Star Online 2 together! You must create a new account to qualify. This account also must have a character who has logged into the game during the campaign period. Players who purchase the qualifying amounts of AC during the campaign period will receive several prizes. Players with certain amounts of friends by the time the campaign is over will receive several prizes. You must log in at some point during the campaign period to qualify. Those with four or more friends prior to the start of the campaign also qualify. This time, players will record and upload videos to Nico Nico to participate in our newest ARKS Museum contest! The ARKS Museum is accepting submissions uploaded to Nico Nico in the following three contest divisions. Fun: Do something fun! Sing! Dance! Anything Fun! Winners will receive a Gold Medal of Thanks, 5000 AC ticket, and a grind success (100%). Winners may see their videos shown in the ARKS Lobby monitors in the PC version. The item codes will be sent to the email address listed on the SEGA ID account. Please be sure that the email address is correct. The work submitted must be created by the entrant. The video must be related to Phantasy Star Online 2. In-game or live-action footage is acceptable. Video editing and enhancements are acceptable. Visual materials, BGM, and sound effects related to Phantasy Star Online 2 can be used in the video. Free or Original resources can be used as well. The video can be up to 5 minutes long. Videos must be submitted to Nico Nico Douga. Upload a video that meets the submission guidelines to Nico Nico Douga. Tag the video using both the 『PSO2』動画コンテスト tag and one of the three divisions shown above. For example if you are posting in the Super Play division you must include both the 『PSO2』動画コンテスト and スーパープレイ部門 tags. Please lock both tags. Fill out the required Submissions Form. Nico Nico Douga’s entire interface can be translated to English by changing the 言語 Language settings at the bottom of every page. Works that fall within the following situations may find themselves disqualified. Works that did not adhere to the submission guidelines. Adapting, altering, republishing copyrighted works created by a third party. Works considered to deviate from the theme. Works that infringe upon a third party’s copyright, intellectual property, personal credit, and privacy. Works submitted to other contests or won previous contests. Works deemed inappropriate, or against public morals. For full contest details, read here. 投稿規約について: Tick to agree to terms. The ARKS Museum is now accepting submissions of photos utilizing the Character Portrait feature on the PlayStation Vita version. Winners will receive a Gold Medal of Thanks, 1000 FUN ticket, an EXCube, and Grind Success (100%). The items can be picked up from the Campaign item menu at the Visiphone. You may use characters saved in the “Portrait Data” menu or NPCs. Please avoid personal identifiable information where much of one’s face and body can be seen in the photo. Please gain consent of other persons who appear in the photo. You may set the character posing and speech bubbles in the Screenshot. The photo must be taken by the entrant themselves. Avoid editing or cropping the photo. Please submit a JPG up to 1MB in space. The photo should be taken in Landscape orientation. Please refrain from publishing this photo on blogs and social networking sites. Display the Player ID Name above your character’s head. You can set what appears over a character’s head in the Quick Menu. Please take this photo in a place where the player id name can be seen. The submission is disqualified if it is sent to anywhere other than the exclusive submission form. You may submit only one set of photo for the contest. Resubmitting a new set of photos will overwrite your previous entry. Once the submission period is over, you will not be able to append any corrections or submit additional photos. Works deemed against public morals, as well as, infringes on a third party’s copyright will be disqualified from the contest. The copyright of the submission will belong to SEGA. If SEGA later deems an entry was inappropriate even after it was published, they will have no choice but to withdraw the submission. SEGA may stop the contest for any reason.